There’s a swarm of activity in west central Georgia. The hum of automated manufacturing lines, heavy machinery and futuristic processing systems is heating up the climate, in anticipation of some 30,000 newcomers converging on two gigantic developments: the opening of the new Kia auto plant in West Point in the fourth quarter of 2009, and the opening of the new combined Armor and Infantry School at Fort Benning next year. The first development is good for West Point, and thus good for Columbus, a regional leader; the second will more heavily impact the city in the form of a whole new economy unlike anything the region has seen before. The impact of the half-billion-dollar refurbishing of the Martin Army Community Hospital by itself is enough to energize this community of 187,000, which grew just 1.2 percent from 2000 to 2006 and has an unemployment rate just over 8 percent. 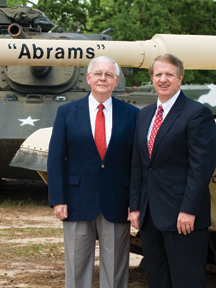 “A few years ago, many people thought BRAC was a military thing,” says Columbus Chamber of Commerce President and CEO Mike Gaymon, referring to the Defense Base Closure and Realignment Commission that made the decision to relocate the army infantry and armor school to Fort Benning. Economic growth in Columbus isn’t limited to the automotive and military arenas. Gaymon is quick to note that existing businesses are thriving. Aflac still is adding 2,000 jobs, announced in 2005, in phases that most recently include a new Information Technology facility; Prosperity America, Inc. is opening a call and customer service facility in Columbus that will add 300 jobs over the next three years; Lance Inc. is adding 70 new jobs as part of a recent expansion; Kellogg is building a new plant; and St. Francis Hospital is expanding. Even banking companies TSYS and Synovus are holding their own in a down economy. Another sector set to take off is tourism, which already is a big part of the Columbus economy, thanks to Columbus State University and local attractions such as the RiverCenter, the Columbus Museum and Springer Opera House, once a favorite of travelers such as Mark Twain and Oscar Wilde. The city has approval from the Army Corps of Engineers to proceed with whitewater rapids on the Chattahoochee River; and the National Infantry Museum, which opens this month, and a U.S. Armor and Cavalry Museum to be built nearby will make Columbus a hub of military tourism (see story, page 89). Graduations at the new combined Infantry and Armor School could bring an additional half a million visitors a year to the region. Synovus opened a new, state-of-the-art data center in Columbus. Even though they are engaged in the continuous improvement project, the facility still opened as scheduled. Hardin in her other role as executive vice president of the Valley Partnership, which represents Columbus’s Muscogee County, in addition to seven neighboring counties and three cities. The Valley Partnership has become a bi-state initiative, incorporating Alabama’s Phenix City and Russell County. With Tier One suppliers Daehan Solution, Johnson Controls and Express Materials locating in Harris County, Hardin is now eyeing Tier Two suppliers but doesn’t foresee the same brisk activity that came with the Tier Ones. The region and state initially had difficulty “understanding this was an economic development project and not a military thing,” says Gary Jones, the chamber’s executive vice president of military affairs, about the Fort Benning expansions. “Now, our work is seamless with communities, the region and Alabama’s and Georgia’s economic development organizations. Jones breaks it down to $100 million in salaries, $250 million in contracts, and $4.2 billion a year overall economic impact to the area. The effort also has been good for creating a sort of bi-state mega-regional community in west Georgia. “The Chattahoochee is the brown rope that ties us together – not separates us,” Jones says. The Valley Partnership supported the Georgia Department of Economic Development’s decision to hire a senior project manager (Chuck Hunsaker) to work on capturing the military population, because Alabama had such a person. “Military growth statewide could approach $22 billion a year,” Hardin says. Donald M. Sando, the maneuver center’s director of capabilities, devel-opment and integration, is working closely with the Valley Partnership to define the center’s needs. The end result will be opportunities for local and defense industry companies to compete for the combat vehicle maintenance, green construction of facilities, modeling and simulation development, as well as information technology and R&D efforts. As a result, defense contractors could rapidly grow or expand their presence in both Georgia and Alabama. “We received a $3 million Department of Labor grant from Washington through the Georgia Governor’s Office of Workforce Development to prepare the citizens and the region to take advantage of the opportunities – whether it’s automotive, technology, green construction, aerospace, healthcare, or other fields. For example, all the buildings on the base require Silver LEED (Leadership in Energy and Environmental Design) standards. That will create a huge need for training for everything from electric to plumbing, to brick and mortar,” Jones says. Speaking of healthcare, the Army is rebuilding its second oldest healthcare facility, Martin Army Community Hospital, at Fort Benning. The mammoth project will cost $570 million and take two years. The new hospital will have the same capacity as the current hospital, and it’s anticipated that approximately 15 percent of base residents’ healthcare needs will continue to be handled at off-base facilities, which include St. Francis Medical Center and Columbus Regional Hospital, a system that now incorporates Hughston Hospital and Rehabili-tation Center (sports medicine), Doctors Hospital, the John B. Amos Cancer Center and Phenix City Hospital in Alabama. “In identifying sectors that will grow, health is a big chapter of that plan,” Jones says. The city, too, must expand its services to accommodate not only new residents, but more visitors – a lot more. Wetherington says the new population will find a lot of things to do in Columbus. “We just finished downtown streetscapes, and it’s beautiful now – we already have Columbus State University downtown with 500 fine arts students and faculty, as well as TSYS, Synovus, and the RiverCenter on the riverbank. Then we have our civic center with ice hockey and arena football, and we’re building a new ice rink and eventually a citizens’ service center with a natatorium. Looking to enhance its tourism, the city also has filed a lawsuit against travel company Expedia that has broad ramifications. “The Muscogee County Superior Court has ruled that taxes should be paid on the retail price – rather than the wholesale price – of rooms sold by Expedia, Orbitz and other reservation companies,” Gaymon says. This is the basis of the lawsuit filed by Columbus. Other municipalities, such as Atlanta and Rome, have filed similar suits. “But we’re concerned because since we filed suit, these companies took all our hotels offline,” Gaymon says, and many room nights are now being booked in Phenix City instead of Columbus. Suit or no suit, tourism will ramp up for the city, especially if plans for whitewater on the Chattahoochee go forward. Columbus’ riverbank is breathtaking; the river, super-wide. It’s a natural fit that could take downtown to the next level, as well as giving students more opportunities for recreation. There’s no shortage of motivation in this town of movers and shakers, and it’s safe to say that no stone has been left unturned. Columbus will be the Georgia city to watch for the next three years. “We’re working on everything with legs that has sustainability for the Columbus region,” Gaymon says.